Since the fall of Berlin Wall in 1989, which served as one of the first public canvases for urban artists, Berlin’s street art scene has been evolving immensely, until the whole city became one of the biggest open-air galleries in the world. The decades of thriving street art scene resulted in Berlin’s reputation as one of the rare cities that embraces public art in all its forms, welcoming artists off various backgrounds. Over the years, many celebrated urban art creators visited Berlin, leaving behind their beautiful works. Whether it was small stickers, stenciled graffiti interventions, large-scale murals or paste-ups, talented artists from around the world brought numerous gifts to the citizens of Berlin to enjoy and cherish each time they step into the streets. Some of those works grew into important landmarks, becoming an essential stop in every street art tour, like Blu’s intricate mural works for instance. Others were lost over time, confirming the genuine ephemeral nature of street art. Among those prominent urban artists, who visited Berlin in an effort to contribute to the already vivid and diverse street art scene is French superstar who goes by the initials JR. Although it was not his first visit to the German capital, JR’s short stay in Berlin during the month of April in 2013 is certainly the most memorable one. If you wonder why, the answer is a line of beautiful paste-ups, a part of JR’s ongoing Wrinkles of the City project. Present on the urban art scene for little more than 10 years, JR relatively quickly crossed the path from being a teenage graffiti writer to becoming one of the most popular and most beloved figures in the street art community. The story of JR’s artistic beginnings is an interesting and often told one. Like many other street artists, he started his career in his early teens with a spray can in his hand, scribbling his tag on the walls of his hometown. It wasn’t until he found a camera on an underground train that his perception of street art completely changed. The lucky encounter with photography came to determine JR’s work in the years that followed, yet he never considered himself a photographer in a true sense. For JR, photography is just the simple medium, the one that marks the beginning of his creative process and art is what is created elsewhere. Strongly believing that streets are the biggest gallery in the world, the one that can reach all kinds of audiences, JR started wheat pasting his photographs on the walls and rooftops of Paris. After the success of his Portraits of a Generation series, which presented the citizens of town’s posh areas with portraits of young people from the Paris housing projects, JR gained wider support and recognition, which allowed him to work on an even larger scale, all across the world. As the years passed and JR’s works became monumental in their size, grabbing the attention of the audience and gaining international popularity and following, the artist never gave up on those initial aims of his work, the ones rooted in social consciousness and activism. Giving voice to those who were silenced by the society and making the marginalized visible again has been a continuous goal in JR’s artistic engagements. With his 28mm wide-angle lens, JR captures the intimate depths of his subjects, underlining the individuality and authenticity of each person, while having in mind universal experiences shared by all human beings. The power of JR’s art is in his ability to create in a local context while keeping a wider social agenda in mind, alluding to the universal ideals through portrayal of individual and unique subjects. By using public art as his primary way of expression, JR counts on the participation of the audience, trying to establish a direct communication with the locals, who are often actively involved in the creation of his artworks. His ongoing efforts in bringing art closer to the people, people closer to each other, and making the world a better place have been awarded the prestigious TED Prize in 2011, granting the artist means to initiate his Inside Out project, which was one of the largest participatory public art projects in recent history. Among many JR’s endeavors that are directly advocating human rights are also those that are more personal and intimate, dealing with the questions of identity in the context of local histories. Among them, the most important one is certainly the project Wrinkles of the City. Starting in 2008 in the Spanish town of Cartagena, Wrinkles of the City has so far taken place in six cities of the world. From the already mentioned Cartagena to Havana, Shanghai, Los Angeles, Berlin and Istanbul, JR did a fair amount of traveling in order to honor the elderly citizens of these places and tell the tumultuous histories of these cities through the wrinkles of portrayed subjects. This sentimental and touching project by the French artist looks into the aging process in order to return dignity to the older citizens who remain forgotten in our youth-obsessed, progress-driven world. Furthermore, Wrinkles of the City aims to capture the wider social and political context of the chosen locations, presenting the aged communities of the cities as important witnesses of modern history turmoil. Authentic and graceful, but presented without prettification, JR’s portraits underline individual features of each of the citizens, while transgressing the notion of individuality through generational stories and aging as an ultimate condition of humanity as a whole. 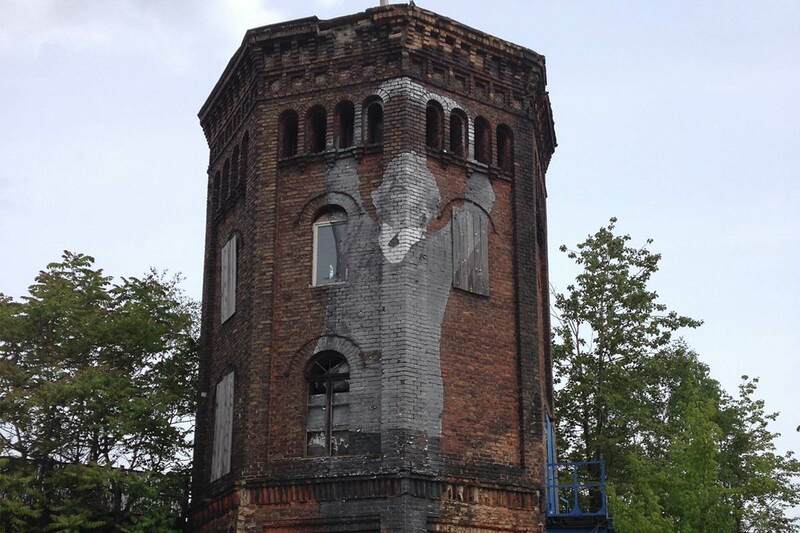 During his short stay in Berlin, which occurred in April 2013, JR worked on over 15 buildings in Berlin’s neighborhoods. The locations for each of JR’s paste-ups were carefully selected, usually through conversations with the portrayed Berliners and in relation to historic events that have left a personal mark on their lives. The elderly citizens of Berlin have lived through some of the most turbulent times in recent history. The memories of the iron curtain, divided country, and spirit of the regained freedom after the fall of Berlin Wall stay vivid in the eyes of the town’s elderly inhabitants. 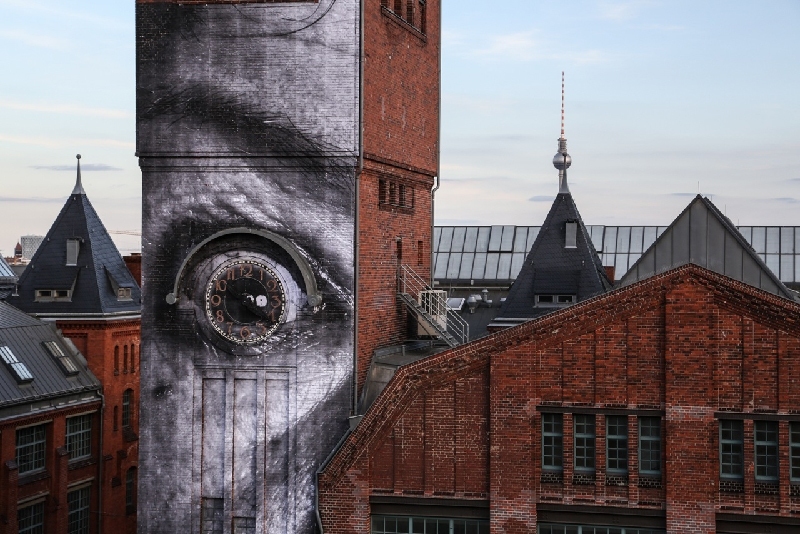 In one of the interviews, JR stated that in case of Berlin he wanted to depict “people with wrinkles on the walls with wrinkles”, alluding to the derelict and crumbling urban infrastructure inherent to many buildings abandoned after the reunification of the country. 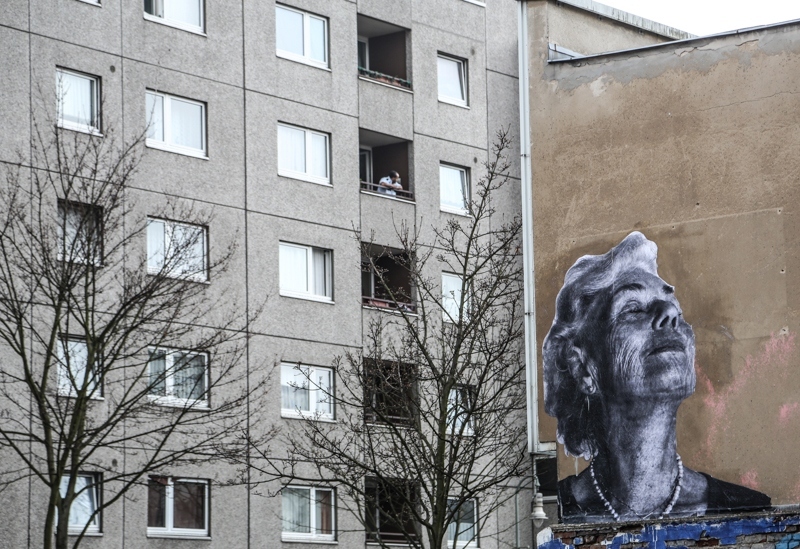 Through citizen’s facial expressions and mindful choice of sites, JR captures the upheavals and transformations of the city, at the same time returning dignity to those elderly inhabitants who have lost their social significance in today’s Berlin. As an art hub, celebrated for its alternative lifestyles, Berlin is often perceived as a city of youth. Therefore, placing focus on the elderly in the context of the German capital is of special importance. 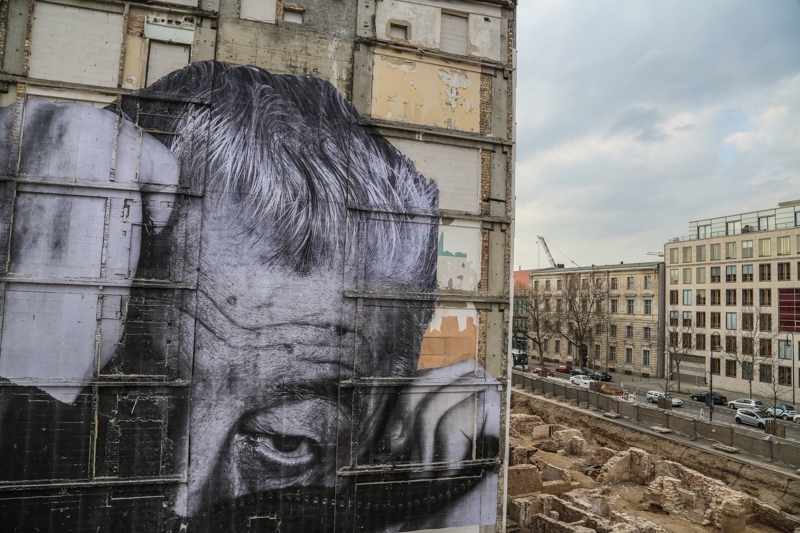 The monumental portraits of elderly Berliners, whose personal histories are melting into the wider context of the town’s historic social changes, are there to remind younger generations of those important events that have shaped their own lives as well. Although JR worked on more than 15 buildings in 2013, many of his works from Wrinkles of the City series have been lost, living up their fate as ephemeral works of public art and being either removed, torn or faded by the weather. However, some of them are still to be found on Berlin’s buildings and they are truly impressive works of art. 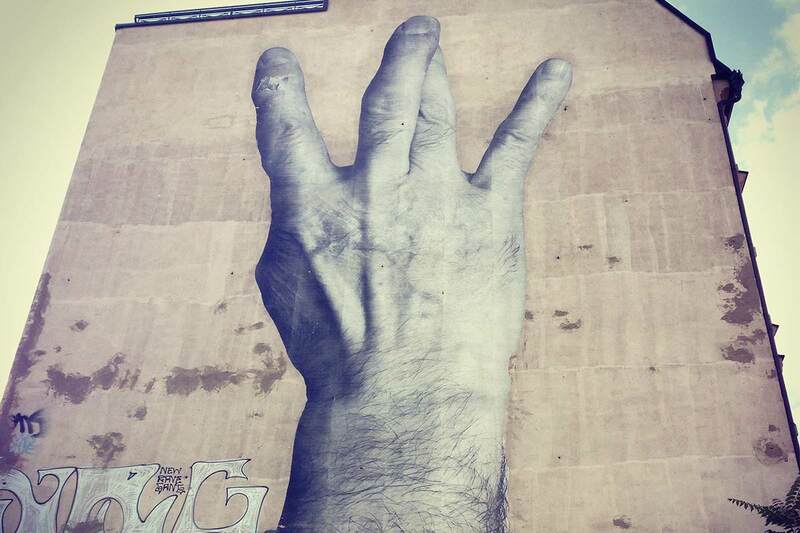 For example, one of the most memorable pieces depicting a hand which gesticulates the Westside sign is still on Invalidenstrasse, as well as JR’s remarkable paste-up on the old water tower behind the Postbahnhof. And if you want to uncover stories behind these pieces, or simply enjoy them as beautiful works of art, book your street art tour next time you’re in Berlin.